What’s in store at the European Sign Expo 2019? One of the most important events on the European sign industry calendar, the European Sign Expo will this year once again play host to some of the major brands from across the market. Taking place from May 14-17, and again co-located with the main FESPA Global Print Expo in Munich, Germany, the event aims to address the key trends in the market and help visitors identify the solutions they need to help their business grow. Exhibitors will showcase a selection of products and solutions from various areas of the market; ranging from screen printing and textile printing, through to interior décor and signage solutions. One of the many exhibiting companies at the European Sign Expo this year is Anchor Magnets, the UK’s largest manufacturer and stockholder of magnetic and ferrous material. The Sheffield-based firm has been the chosen partner for retailers, printers and manufacturers across the world since 1984 and is seeking to share its capabilities across the sign and print market. Caption: Anchor Magnets has been supporting retailers, printers and manufacturers across the world since 1984. In terms of what we can expect on the Anchor Magnets stand at ESE, James gave FESPA.com an exclusive insight into its plans. Those in attendance will be able to see the Supamag Magnetic Sheet Range, which James describes as a product with “leading strength capabilities and high dyne levels for excellent print quality”, as well as the Supaferro Flexible Iron Sheet Range, a product that interacts with magnets in the company’s range to help create the perfect environment. Also on show will be Digifilm Ferrous Media Range; the Supamag Magnetic Tape Range, with high pull strengths and quality adhesives; the Attract Magnetic Display System quick change alternative to material graphics; and the Magfix Holding and Hanging Product Range. In addition, Anchor will be displaying its Boutique Rubber Coated Magnets – a range of powerful, scratch resistant magnets to hold POS to ferrous material and steel shelving systems – as well as the extrude magnet collection, where they are the only UK company with the production facility to produce bespoke profiles for a variety closure, labelling and mag strip applications. “Visitors to our stand can learn about the ease of use and applications of Anchor Magnet products,” James said. “They can also find out about our printable range of sheet products for UV, eco-solvent, latex, screen, litho, digital and toner, as well as see how our magnetic and magnetically receptive products can interact to create changeable and engaging display in all environments. Another company due to appear at the European Sign Expo in May is SloanLED, which, as its name may suggest, specialises in the supply of LED solutions for signage and related products. Trudy Kersten, marketing office manager Europe at SloanLED, said the main goal for the company at the event is to connect with both new and existing customers. Kersten said: “Visitors should come to our stand at the European Sign Expo because we will be showing our latest products. We also invited attendees to ask as many questions about our products and services as they like, so we can explain how they can help their business. In terms of what visitors can expect on the SloanLED stand at the event, Kersten singles out a number of key products to FESPA.com: Prism Nano, Prism Mini, PosterBox Mini; VLPlus3. SloanLED describes Prism Nano as the “revolutionary LED lighting system” that delivers big performance in routed acrylic block letter, shallow channel letter, and backlit halo letter applications as shallow as 25 mm. Prism Nano features elliptical optics in a range of colour temperatures, including 7200 K, 6500 K, 5000 K, 4000 K, and 3000 K, for what SloanLED said will deliver bright, uniform illumination. Caption: SloanLED will showcase VLPlus3, an LED solution for illuminating standard face lit channel letters, on its stand at the European Sign Expo 2019. Prism Mini is a smaller version of Prism Nano, suitable for illuminating small channel letters between 50 and 100mm deep. The product features a micro prism lens that produces a wide, even light spread across a broader array of applications requiring a smaller form factor. SloanLED said it the brightest and most consistent lighting option in its class. PosterBox Mini is an edge-lit cabinet lighting solution for lightbox applications as shallow as 50mm deep. SloanLED said its design and adjustable spacing gives installers “unprecedented freedom”, making it a solid choice for a variety of applications. In addition, VLPlus3 is an LED solution for illuminating standard face lit channel letters. Available in white at 6500 K and red, VL Plus 3 has a viewing angle of 160° – achieving twice the maximum coverage per row at 10 inches – as well as light output of 150 lumens per foot (6500 K). SloanLED also cites its efficacy of 103 lm/W (6500 K), which it said delivers “both value and performance”. Elsewhere, long-term supporter M&T Displays will return to the European Sign Expo to showcase its latest solutions to the industry. Ceyda Basgul, sales and marketing director, said the event is important to the sign and display solutions provider, as it is a place to meet international buyers, introduce new products and create new clients. Basgul told FESPA.com: “In order to protect market share, it is important to keep up with expectations and demand from the market. Casual approaches and face-to-face appointments with key accounts are perfect way to introduce new products or products they are looking for. It is also a perfect chance to build relations with the new prospects. 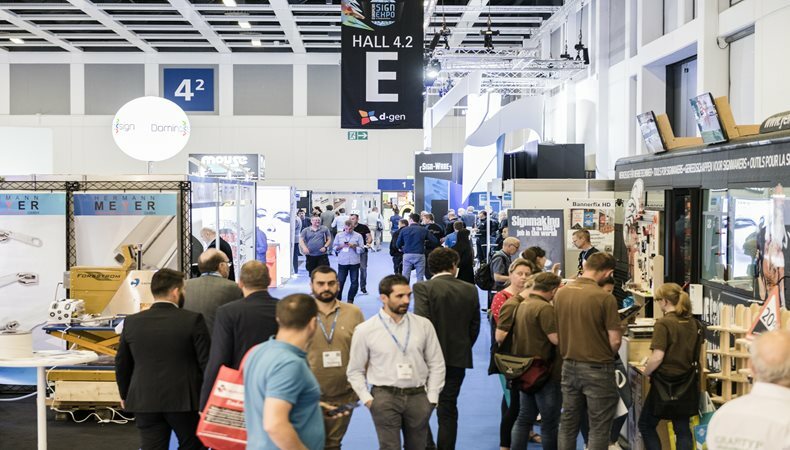 “The European Sign Expo provides many opportunities to connect with the local and global industry professionals, allowing us to meet business owners and, subsequently, leverage the best contacts. This is invaluable in today’s competitive market. Focusing in on the M&T Displays stand, the company will be displaying its new range of wood and plastic sheets, as well as new additions to its illuminated portfolio, including as Buy Max LED Frame and LEDA LED illuminated Totem. Basgul said visitors to the M&T Displays stand will be able to see demonstrations of all of its products, as well as examine, handle, compare, see, and even smell the solutions to see if they are right for their own business. FESPA European Sign Expo 2019 is Europe's largest exhibition for non-printed signage and visual communications. Over 4 days visitors will have the opportunity to experience the latest products and innovations on display from over 100 exhibitors. Visit Anchor Magnets on Stand L65 in Hall A4, SloanLED on Stand L18 in Hall A4 and M&T Displays on Stand K38 in Hall A4. Please use promo code ESEH901 to register for free.